1.Product Name:Mini Bike with Computer. 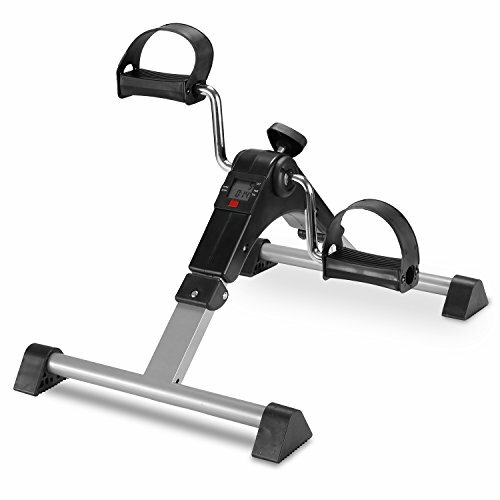 This Pedal exerciser is a compact exercise bike that stores conveniently out of the way when not in use. Use it regularly to stimulate blood circulation and increase muscle strength: it is a great way to enjoy a moderate cardiovascular workout. Place it on a tabletop to exercise your arms or on the floor to enjoy a bicycle-type exercise from your chair. Function:When exercising,fold it into two layers,lay this mat under the cycle,you can enjoy a perfect process.After finishing exercise,pave it on the floor near the bathroom door. NOTE: 1.Pedal resistance is produced by friction，so the metal part would get hot,it is normal phenomenon. 2.If there any part missing , please feel free to contact us , we will ship you freely. Smart and contracted bike for leg & arm cycling exercise,under desk,on table, indoor or office anywhere you can. Foldable design makes the peddler portable and easy to store,very easy to fold and open,without any installation. mostly used for elderly who need leg or knee light exercise. also used for the people after knee surgery.